There is a real unique silhouette to the KRMA. The combination of the high AFC inlets and the tapered and then convexed top of the top cap have a real industrial flair. The clean lines make it look great on any mod. The overall aesthetic has an effect of making the height look more substantial than it is giving a real high-end statement. Underneath this top cap is where the magic begins. Beautifully crafted internals with not a sharp surface anywhere. Two channels to help align coil placement and extended AFC inlets make sure the airflow directly targets the side of your coil. It’s a clamping style post design. One open ended clamp and one closed clamp making building a cinch. Although I wish both clamps were open, don’t see the need for one to be closed (it makes the build a little more awkward than it needs to be). Beautiful little details like the clamp posts being inset just enough to allow for easy wire lead clipping (also helping reduce the chance of hard shorts) or the to cut outs in the top of the posts to help create a vortex of air really help elevate the KRMA to it’s own place in the market. We were lucky enough to get our hands on a Bright version (glass blasted) and the soft finish is perfect and covers both the deck and top cap but doesn’t hinder use like other competitors have in the past. The o-ring tolerances are spot on, some of the best we have seen in a long time. Basically the aesthetic and design thinking are simple nailed. Flavour is very good. Now lately with all these dual airflow on a single coil attys it’s getting more and more subjective. It is really about where the airflow hits the coil. For the most part the KRMA is a side hit, you can elevate your coil for a bottom hit but in our opinion that isn’t the design. You get some very saturated flavour and changing out the included drip tips for a smaller bore can attribute to even more saturation. What makes the KRMA really standout is the airflow. The channels are cut tall in the side of the posts and the air travels down from the top cap inlets and then out to the coil in a Z or L like pattern. This seems to reduce sound and turbulence and create a swoosh, silky, smooth draw. So many of the dual airflow attys suffer from whistling and added noise, it’s so refreshing to be rid of this in the KRMA. You will enjoy every haul on this baby. Building like we said earlier is very simple. The included stainless flat head screws hold tension well and torque down easily. The post holes are large and can hold any build you want. You could fit up to a 4mm build but we like around a 3mm and wether it’s a clapton, alien, or simple round wire, they all perform. We are rocking a 5 wrap, 26/38×2, N80 Clapton, 3mm, 0.3 Ohm on a mech squonker and get a perfectly warm vape with zero spitback. Juice capacity is great thanks to a deep juice well, but really I think most of us are using the included BF pin and squonking with this atty. But if you wanted to drip it would do well. The Squonking action is good and the design of the AFC makes leaking an impossibility. The Mission XV KRMA is a solid contender for some of the freshest thinking in a crowded space. It’s hard to carve out a space in this market and even harder for it to be your first product to market. This is a serious accomplishment. The price is fair for all the kit you get (2 top caps, 2 driptips, BF pin & spares). Getting them isn’t the easiest but they do run lists frequently on their closed Facebook group. The packaging is super dope, the best we have ever seen. We have gushed enough, go out and grab a KRMA you won’t regret it in the slightest. Congrats Mission XV! 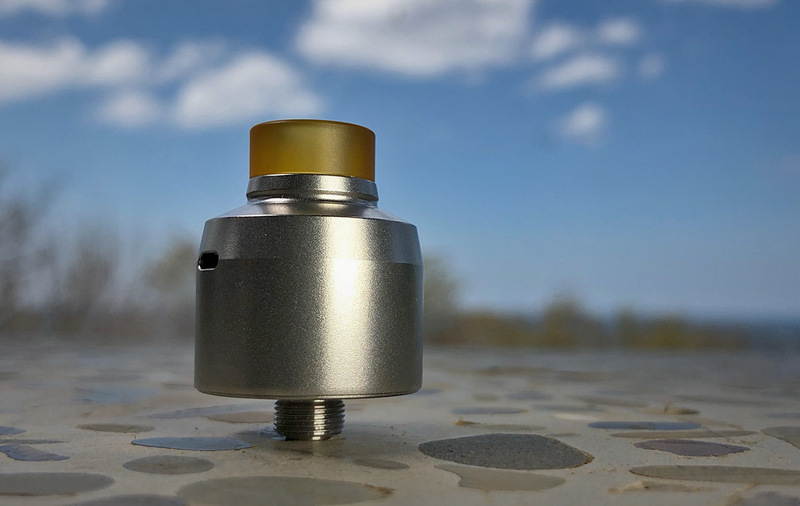 what about the cheaper rda like wasp nano rda, maze v3 rda, gorge rda, kaees aladdin rda? Its not rifle gear blog. This guys sell only real gear ad.